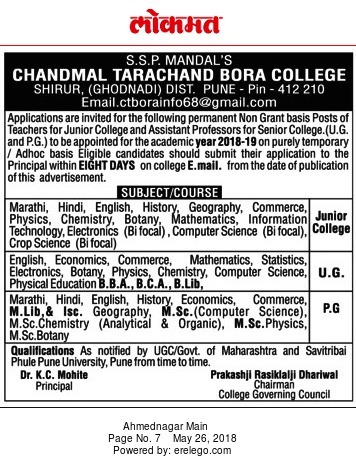 Chandmal Tarachand Bora College, Pune has advertised in Lokmat newspaper for the recruitment of Assistant Professor plus Assistant Teachers jobs vacancies. Interested and eligible job aspirants are requested to apply with in 8 days. Check out further more details below. About College: Chandmal Tarachand Bora Arts, Commerce and Science College, Shirur, affiliated to the Savitribai Phule Pune University (formerly University of Pune) was established in 1968 by Shirur Shikshan Prasarak Mandal, a local educational trust, with the primary aim of providing quality higher education to the educationally and socially backward local community. The college is situated in a predominantly agrarian community consisting largely of economically and socially backward rural and tribal population. The Shirur Shikshan Prasarak Mandal was initiated by a few philanthropists and social visionaries to spread education among the local population. In this context the Vision of the College is to become an excellent centre of higher education, of teaching and research providing quality education that is technically advanced, socially and morally relevant particularly to the rural students, and to groom them to face the challenges of the emerging global scenario and to benefit from growing economic opportunities.